How does Stella4D determine the dual? So, my current object of study is the "Chestahedron". (See interactive version, & dynamic.) Basically, it's a heptahedron where the 7 faces are of equal area (3 congruent equilateral triangles, & 3 congruent kites). 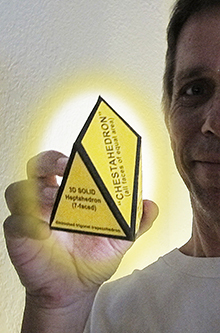 Among many things, I'm interested in the dual of the Chestahedron. All references I have found give methods for a REGULAR solid, which the Chestahedron is not. I have generated some interesting "duals" based on some of these methods, plus some variations I have concocted. 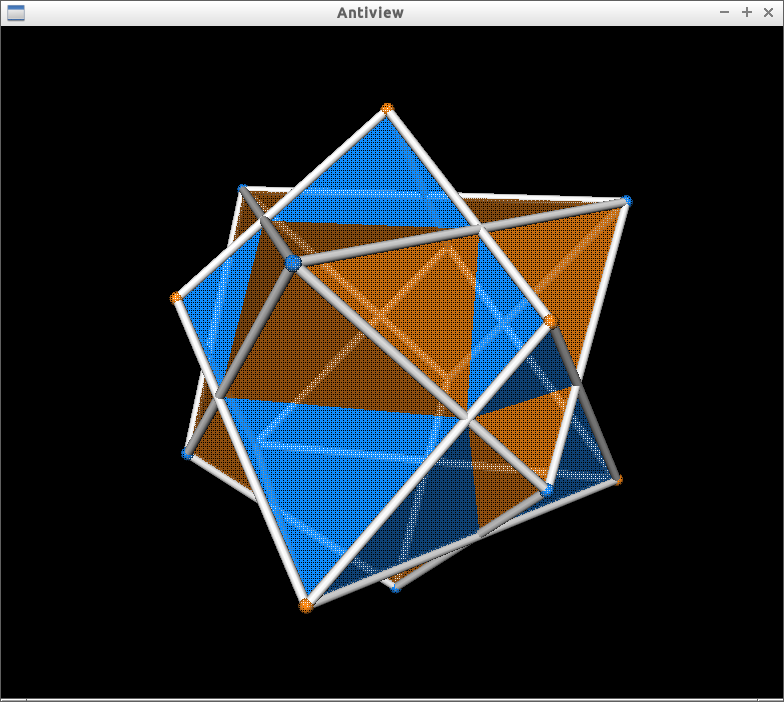 I have made a Chestahedron by importing an OFF of points only, then Stella4D made the convex hull, and then the dual. Here is the STEL file. 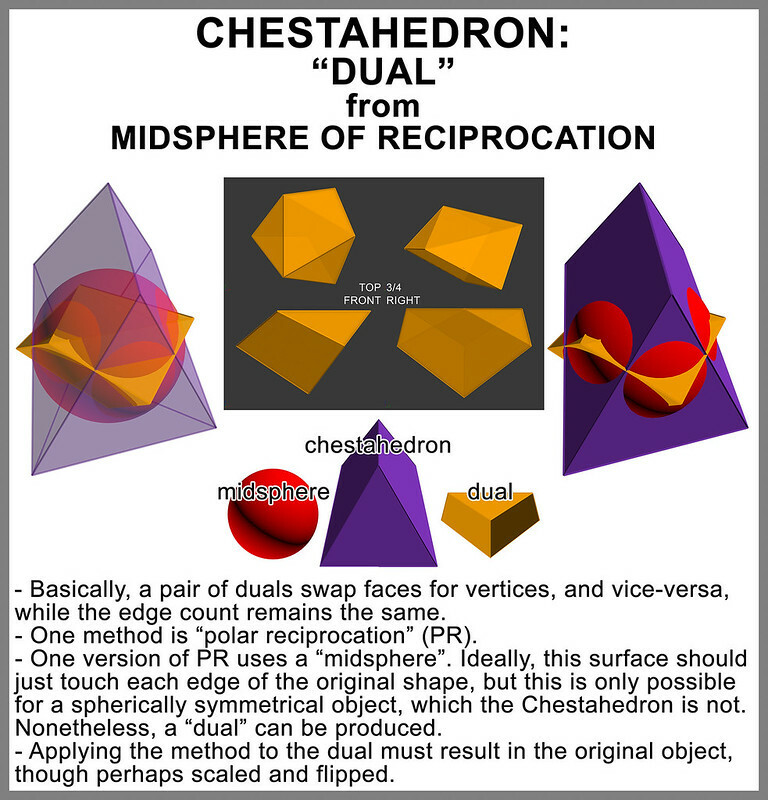 One correspondent claims the Chestahedron is self-dual, though I can graphically demonstrate it is not (at least if I'm correct in my understanding: the dual must fit inside its reciprocal and have each vert uniquely touch a face of its reciprocal). Now, for a regular polyhedron, a simple method to get the dual is to locate a vert at the centroid of each face, then connect to form the new solid. 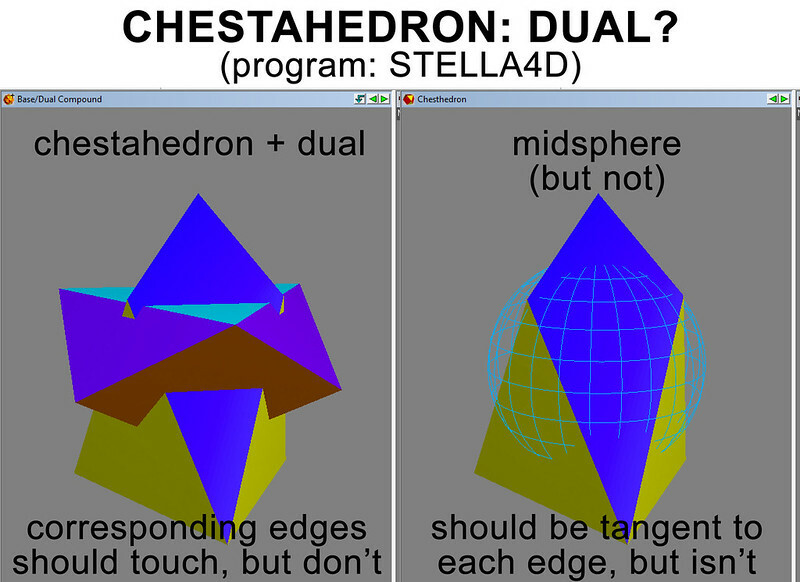 But this clearly does not generate a proper dual for the Chestahedron (again, I can graphically demonstrate this). Dual from the inELLIPSOID. The Chestahedron is not regular, nor does it admit a circumsphere, midsphere, or insphere. It's a bit elongated, so an ellipsoid seemed a reasonable alternative. In fact, I have found the circumellipsoid, and the inellipsoid. Using the in ellipsoid, I locate a unique point on each face (not a centroid). Connecting these yields a solid that at least conforms to the requirements for a proper dual. Also, it is like a (inverted) Chestahedron, but with different proportions. 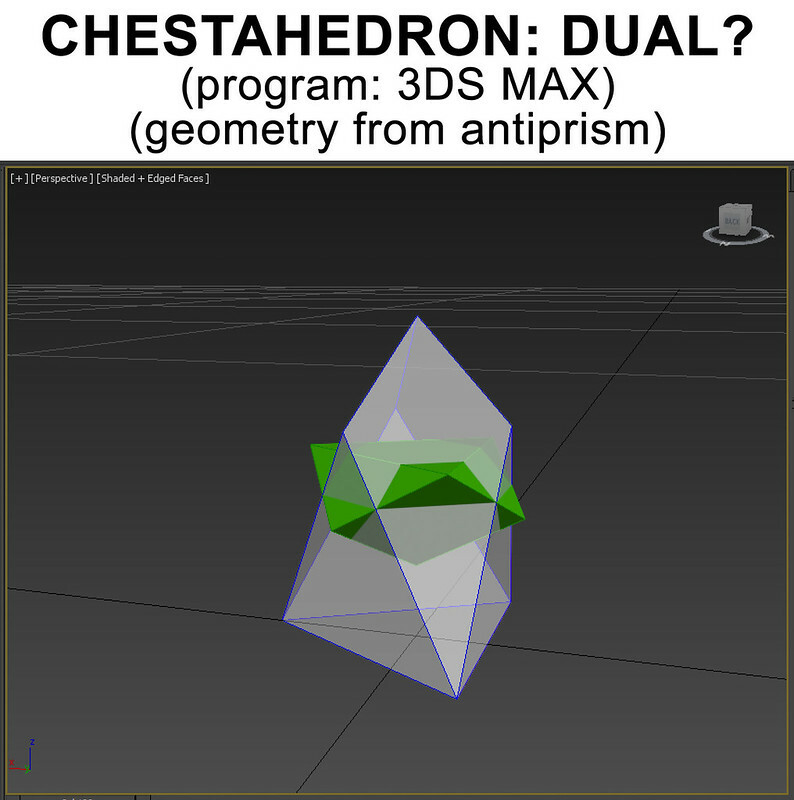 (Note: This is very close to a Chestahderon with an areas ratio of 2:1 (in a family I call "k-Chestahedra", where k is a non-zero positive integer representing the ratio of areas). Since I did this graphically/experimentally, not analytically, it is inexact (though quite close), which might account for the numbers not showing it to be exactly a k-2 Chestahedron. So, this matter is still open. FYI, in addition to the above investigation, and using Stella4D, I have attempted to use Macaulay2, but with limited success. It does find duals (the 'polar'), but is not a geometry app, per se, but for algebraic geometry/commutative algebras - and therein lies a snag:( The dual it returns almost conforms as a proper dual, but it includes a "ray". Unfortunately, at this time, I do not fully understand what this is in the context of the realm of Macaulay2. It's a direction associated with a "cone". Anyhow, regardless of what it is, it prevents me from getting a proper solid to inspect - though I have looked at what it generated, and it does not look "correct". In closing, I seek the dual of the Chestahedron. My understanding of a "dual" is decent, but not complete, and possibly in error in some aspects. I'm hoping to clear up all of this, and come to a properly informed presentation of the Chestahedron dual. And again, I ask, How does Stella4D determine the dual? TIA. Antiprism documentation gives a very good explanation of the dual, and provides pseudo-code for computing it, along with variations regarding choice of the center of reciprocity. Also. found excellent textbook treatment (mathematical). And, a related paper. I see in Stella4D: Poly > Center for Reciprocation > Use Center of Vertices; Use Centroid of Edge-midpoints; & Use Circumcenter. These are also offered in Antiprism. Now, perhaps the dual implementation is gotten from a library, like CGAL? OK, here are the duals from Antiprism, & Stella4D. I think they used the same method, and same settings (maybe; at least results looks pretty similar. I would really like to know what makes a "proper" dual. Perhaps one does't have to fit snuggly inside/outside the other, but they certainly do for the regular solids of seen. TIA. Last edited by Swami Polytope on Sun Aug 23, 2015 5:43 am, edited 1 time in total. The canonical form of the chesterhedron is geometrically self-dual by reciprocation in a sphere. 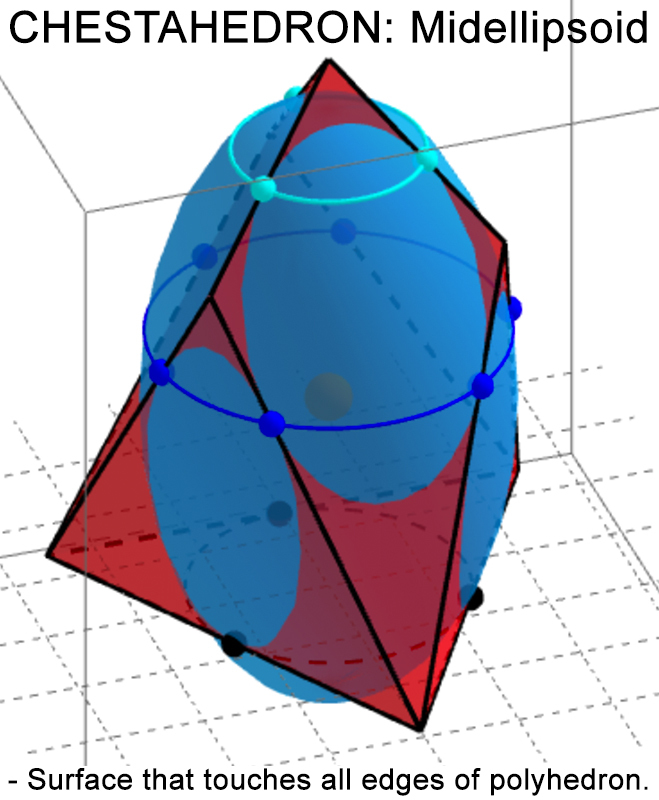 The chesterhedron itself may be geometrically self-dual by reciprocating in some other quadric surface. In the range of models having equilateral triangles, like the chesterhedron, I believe that the only convex model with a (internal) midsphere is the one having the dihedral angle of an icosahedron at the base. ..."the only convex model with a (internal) midsphere is the one having the dihedral angle of an icosahedron at the base." The term "dual" isn't well defined for polyhedra. If the base model has central symmetry and you reciprocate in a sphere with this centre then you will probably get general agreement that the result is the shape of the dual. If the base model also has a midsphere and you reciprocate in this then the result has the same midsphere and it is easy to say the two models are dual by reciprocating in the midsphere. 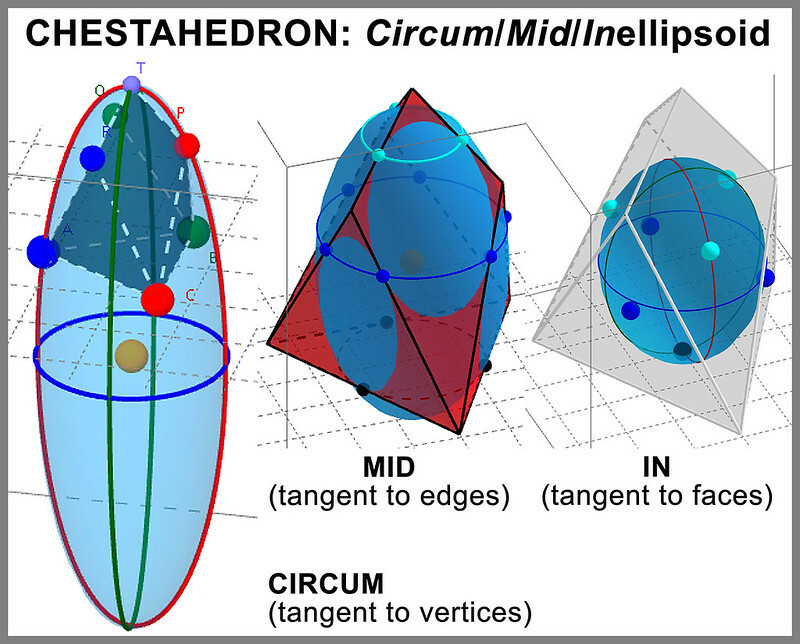 The situation is different for models like the chesterhedron that have axial but not central symmetry. As a simple example, what is the dual of a right regular pyramid? I think you will have trouble getting agreement on an answer to that, but, where constructible, there is a particular reciprocation sphere that makes the model self-dual, which I think most people would see as more dual-like than reciprocation in the midsphere. With regard to reciprocating the chesterhedron in the midellipsoid, the dual edges will be perpendicular to the base edges at the tangent points, and so the dual will not be another chesterhedron. First, please could you shrink that huge screenshot? It is vastly bigger than my poor screen and makes all the text shoot off to the right. Duality of polyhedra exists at several different levels. Sometimes, a polyhedron will have a dual at one level but not at another. This establishes the basic dual pairings - cuboid with octahedron, pentagonal dodecahedron with icosahedron, self-duality of the tetrahedron, etc. If we consider regular solids, and some other fairly symmetrical ones, we can use various constructions to make the dual of a polyhedron: we might join face centroids, or construct a sphere tangent to all vertices and strike tangent planes, or construct an intersphere tangent to all edges and strike orthogonal lines to make new edges. But as our chosen solid gets less regular, perhaps even non-convex, these do not always give similar geometric solutions - if they yield any. All these constructions turn out to be examples of reciprocation in a concentric sphere. This construction is an example of a more general one in projective geometry, where the sphere may be of arbitrary size or location or indeed, as Adrian pointed out, may be any general quadric surface. 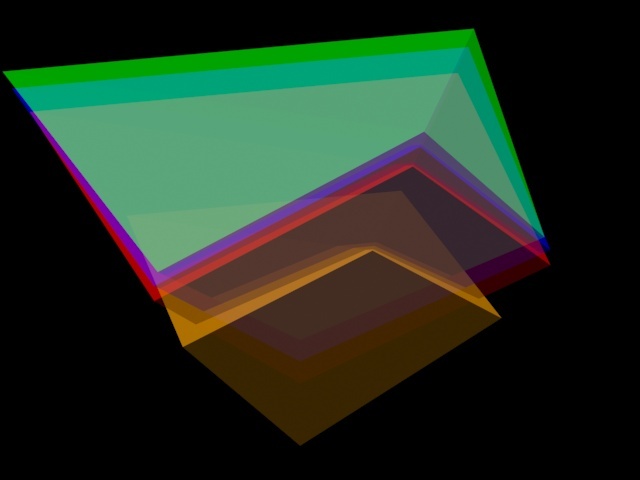 The choice of surface, scale and position all affect the geometry of the dual figure which results, although all will be isomorphs of the same combinatorial polyhedron. Some of these isomorphs will be so spread out across projective space that their isometric mapping into Euclidean space can never conform to our intuitive ideas of a polyhedron, in that they must extend across infinity. Magnus Wenninger's duals of the "hemi" uniform polyhedra being the most famous example. He gives some account of the problem in his book, "Dual Models". For convex polyhedra there is a "canonical form" which is a morph wrapped around a sphere such that every edge is tangent to the sphere. The "canonical dual" figure may be readily constructed and, for a self-dual structure will be congruent to the original. Your Chestahderon is an example of a combinatorially self-dual figure but it does not wrap around a sphere in canonical manner without spoiling its area relationships. Fortunately, the construction can be generalised to any quadric surface. One cannot call it canonical, since it is arbitrarily chosen and I doubt that a suitable quadric can be found for every convex polyhedron. But you got lucky. Thx again, Adrian. I appreciate your knowledge in this area. Started to write more of a reply, but realized I need to consider things more, and do some testing. So, will get back to you, but wanted to confirm receipt, and show appreciation. 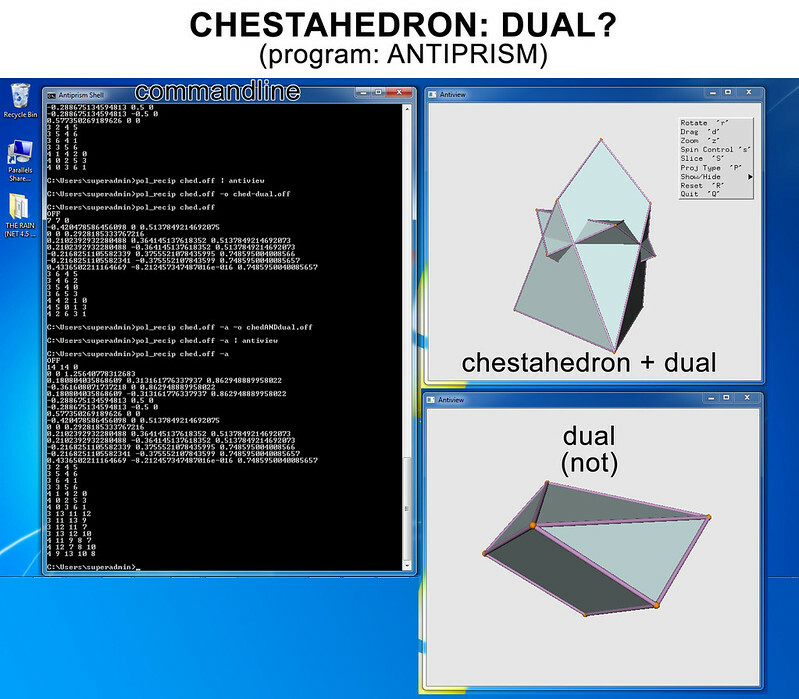 The graphic above shows one version of a dual for the Chestahedron. This "polar reciprocation" method can produce similar, but slightly different results, depending on how the "center of reciprocation" is calculated. As noted, applying the method to one object must result in the other, which it does in the case shown. ...A midellipsoid better fits the Chestahedron. Interestingly, by inspection, it appears that the center of this midellipsoid (determined "experimentally") coincides with the center of the midsphere that was algorithmically calculated. Anyhow, I'm interested to find out what the dual is when this midellipoid is used for reciprocation. I'm not quite there, yet, though. I need to study the algorithm/s used based on the midsphere and determined how to modify them for a midellipsoid. On a side note, the question has arisen: What is the dual of a random polyhedron (i.e. one without spherical, ellipsoidal, or any symmetry)!? Polar reciprocation could certainly be applied. Or a canonical form could be determined, then used to find the dual (though not the same thing, of course). - E, A, & V centres (i.e. with inversion) gave same results as without - at least that's how it appears to me. - These are in their proper relative position, and scale. - Though alike, these shapes are not identical - at least from a quick visual inspection, and of angles via Stella4D. As for the Chestahedron and the midellipsoid I discovered for it - yes, I got "lucky":) And, as noted in last reply, I'm curious to see what might come from using it as the surface of reciprocation. Also, looking forward to checking into the 'Vertex Figures' link, plus your polys page! Thx. P.S. You'll notice that I fixed the "large image/text runoff" problem. New to this forum and its environment. Learning as I go:) Thx for your patience. Swami Polytope wrote: And, as noted in last reply, I'm curious to see what might come from using it as the surface of reciprocation. Polar reciprocation is a construction in pure projective geometry. This geometry has no idea of metric, i.e. of distance or angle. To a projective geometer a sphere, ellipsoid, hyperbolic paraboloid or any other such quadric surface are indistinguishable from each other: it is only when metrics such as length or infinity are introduced that they become distinguishable. 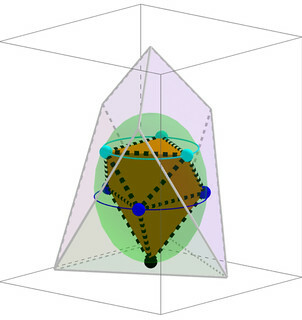 Since the reciprocity of your Chestahedron about an ellipsoid is a construction based on the principles of pure projective geometry, its related properties will be invariant under any projective transformation. In Euclidean space, a simple stretching along one axis is just such a projective transformation. So no matter how much the construction is stretched or squashed, we know it will remain a valid projective reciprocation. Going back to the canonical construction of the solid and its dual, we can readily see that your Chestahedron/ellipsoid construction is a simple stretching of the canonical construction and that symmetries relating to the stretching axis are preserved. In particular, the relative volumes and proportions of the polyhedron and its dual are preserved: they remain congruent. That is, the dual of your Chestahedron, obtained by reciprocation in an edge-tangent ellipsoid, is congruent to the Chestahedron - in short, it is self-dual about the ellipsoid. Projective geometry is a funny thing. Despite its most pure form having no concept of angle or distance (i.e. no concept of coordinates), it is most often taught using a Euclidean metric with yet another coordinate bolted on top. let me know if you get baffled. Also, be warned - projective geometry has its own fundamental duality (the reason it is the most elegant and concisely expressed of all geometries). The duality of polyhedra appears at first sight to be an example of this projective duality. But, depending on how you define polyhedral duality, and also on which kind of space you put your polyhedra in, that may or may not be so.